← Vrije Universiteit goes for Open Access publishing! I am of somewhat mixed feelings about the whole “controversy”, if indeed it is one. On one hand, I probably wouldn’t be thrilled if a right-winger wrote a comic caricaturing liberals as fanatical communists (though I wouldn’t be whining about it), on the other hand in my opinion the strip doesn’t depict anything that isn’t spot on. I’m sorry to see that Marvel felt like they had to apologize for an artistic decision by a writer, though I can somewhat understand that they are an entertainment business that doesn’t want to alienate any customers. 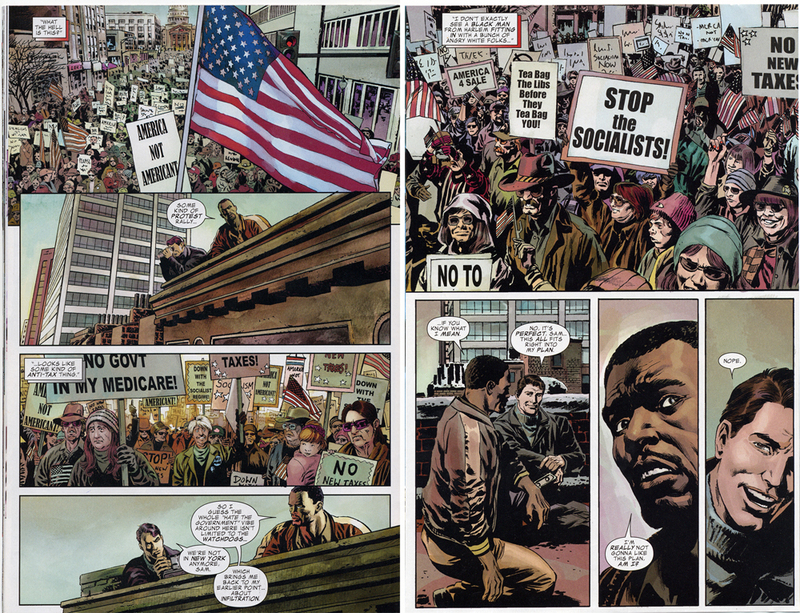 One thing I’d like to point out, though, is that the Captain America comic has a long history of addressing social issues. This isn’t the first time that its writers have used the book and the character as a mirror to show its readers some of the unpleasant traits of America. When I was a teenager, I read lots of comics, and I consider myself very fortunate to have begun reading Captain America just as writer Mark Gruenwald took the reins. Gruenwald had an amazing 10-year run on Captain America, running from 1985 to 1995 and covering issues #307-#443 (with only one guest-written issue in between). I’ve long ranked Gruenwald’s Captain America as one of my favorite comic series of all time. He took the character and made him not just a burly superhero, but a human being who suffered from doubt, guilt, struggled to find a day-career — and even went on dates! In my eyes, Captain America during Gruenwald’s run really represented about as close to the American ideal as any fictional character could. The part of Cap’s mythos in most need of help, in my opinion, was his rogues gallery. A hero is only as great as the foes he triumphs over, and when I took on the book, Cap really had only three or four good foes — the Red Skull, the Viper, Batroc, and Baron Zemo. I feel a solo hero needs at least twelve — a different one for every month of the year. So I embarked upon a rigorous campaign of villain-making. My inspiration for Cap’s foes came from Cap himself. Unlike most heroes, Cap represents something — America’s ideals. To give those ideals something to play off against, his foes should represent some aspect of America’s reality. I made a list of themes and issues that have something to do with modern day America, and then concocted foes to embody them. Thus I took anti-patriotism and came up with Flag-Smasher, right wing militias and came up with the Watchdogs, trade unions and came up with the Serpent Society, the drug trade and came up with the Slug, slacker youths and came up with Madcap… Okay, not every one was a classic, but I do think that Cap now has at least twelve workable, recurring foes. Gruenwald invented the right-wing Watchdogs as a reflection of the militia movements of that time. Apparently right-wing militias are timeless because it is those same Watchdogs that Cap and Falcon are investigating at the teabagger rally that caused so much controversy. Immigration concerns. Concerns about immigration, in particular from Mexico, seem to have been personified in the villain Armadillo, originally Antonio Rodriguez, a fearsome-looking but ultimately misunderstood bad guy. Vigilante justice. The villains of the Marvel Universe lived in fear for a while of the mysterious Scourge of the Underworld, a vigilante who killed many of their number with a modified submachine gun. This seems in part to be a response to films such as the “Dirty Harry” and “Death Wish” series. Patriotism for profit. Cap was challenged for some time for the title of “America’s super hero” by a cynical fellow named John Walker, who adopted the moniker Super-patriot and promoted his image through rallies, rock concerts, and corporate sponsorship. Drug addiction. In addition to introducing the drug-dealing Slug, mentioned above, Gruenwald has a mini-series called “Streets of Poison”, in which one of Cap’s employees is found to have a drug addiction. Cap himself is confronted with the fact that he himself benefits from drug use, namely his super-soldier serum. By the end of the series, he forgoes his serum for some time in order to set a good example. Police brutality. To depict vigilante behavior in law enforcement, Gruenwald introduced AmeriCop, a former police officer who becomes an independent judge, jury and executioner. Performance-enhancing drugs. Though he didn’t create the character, Gruenwald used the Power Broker as a villain selling super-powers to people so that they could join a professional wrestling league, a plot that reflects on the plague of performance-enhancing drugs in sports. Rule of law. In one fascinating story arc, Cap is forced to shoot and kill a terrorist to prevent him from killing hostages. Cap is haunted by his decision, and willingly turns himself in to an international court to face trial for his act. Amoral ultra-capitalism. The Red Skull, Cap’s greatest villain, was reborn in Gruenwald’s era and decided to forsake his Nazi roots in favor of using American capitalism to his advantage. In an unintentionally prescient move by Gruenwald, it is later revealed that many of the “independent” villains such as the Scourge and the Watchdogs were actually created and cynically manipulated by the Skull from behind the scenes. Terminal illness. In a rather touching series of final issues, Gruenwald revealed that Cap was suffering from a terminal illness that was an inherent flaw in the super-soldier serum coursing through his veins. Faced with letting villains get away with their schemes, Cap fights on, becoming increasingly disabled as the series progresses. In a final touching issue, Cap receives a premonition that he is to die within 24 hours. He spends the time reflecting on his career and getting in touch with friends, and has one genuinely moving chat with one of his most regular villains (Batroc) and tries to convince him to give up crime. Cap vanishes mysteriously at the end of the issue, leaving the stage open for the next writer to take over. As far as I’m concerned, though, Cap died with dignity when Mark Gruenwald stopped writing him. The end of Cap eerily foreshadowed Gruenwald’s own death. In 1996, he succumbed unexpectedly to a heart attack due to a congenital heart defect. His work has stuck with me, however, and I find the recent teabagger outrage ridiculous because of it — if Captain America can’t confront social issues, who can? * Yes, I still own all my Captain America issues. This entry was posted in ... the Hell?, Entertainment, Politics. Bookmark the permalink. I think you owe it to yourself to check out the current Ed Brubaker run, then. After the whole Civil War thing where Steve Rogers got assassinated, Bucky took over as Cap, and his struggle in trying to fill Steve’s shoes while trying to defend Captain America’s name from those who would abuse it for their own ends is really well-written. I have to say, though, that what amuses me here is that, near the beginning of Ed Brubaker’s run, he did a storyline where Bucky as Captain America investigates a Minutemen border patrol group that claims to have the real Captain America on their side. It’s a fake, of course, and the group are portrayed as blatant white supremacists who, in the finale of the arc, actually cross the border into Mexico to torch and murder an entire Mexican town before Bucky shows up to stop them. WAAAAAAAAAAAY less flattering than the current story about 50s Cap participating in the tea party protests, but I don’t remember anybody complaining then.